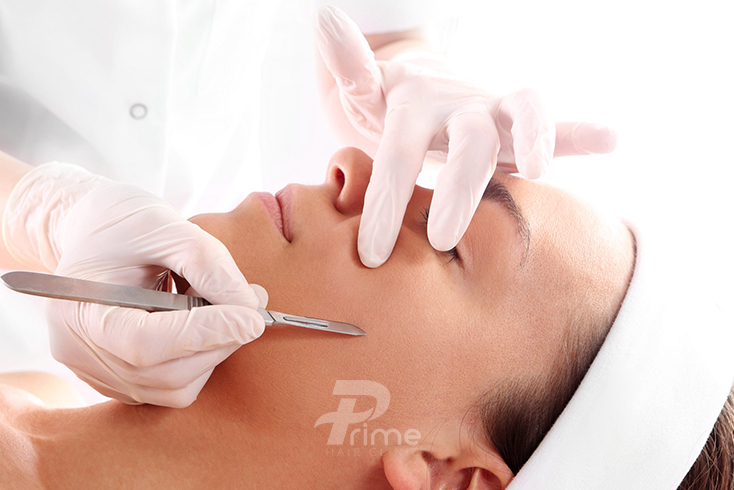 Dermaplaning is a medical procedure that exfoliates the skin by removing dead skin and vellus hair (peach fuzz). The procedure is performed by our expert staff, who will gently glide a scalpel blade across your skin, removing the outermost layer of skin cells and hair from the face. The blade is used on clean, dry skin on the forehead, cheeks, chin, nose and neck. As a byproduct, it also shaves off all hair, though the hair will grow back at the same rate and texture as before. The process takes up to an hour to perform and leaves the skin fresh and smooth and the pores open, allowing for improved penetration of skin care serums or PRP. Ever wondered how models can be photographed close-up at every angle without revealing even a hint of facial fuzz? It’s all thanks to dermaplaning. Essentially, this treatment involves using a sterile, surgical-grade scalpel to shave carefully, or scrape, the top-most layer of skin and fine hairs from the face. The concept can sound terrifying, but for many, it’s the secret to clear, even, smooth, and hair-free skin. It also enhances the effect of your favourite facial serum as your pores are clear from all the dirt, makeup, and dead skin that normally blocks them. Dermaplaning is just one of our ever-expanding aesthetic treatments we are happy to offer you by one of our beauty experts. Dermaplaning is suitable at all ages. While most skin types can benefit from the treatment, our staff do not recommended dermaplaning for acne-prone skin. No, the light vellus hair that you may have on your faces will grow back the same texture, shape and color. If you have a few courser, darker hairs, they will likely come back the same way. Not at all. In fact, many clients report feeling relaxed and enjoy the sensation of the blade grooming their skin. For many, this treatment may be more comfortable than Microdermabrasion, and there is no “stinging” as is often associated with chemical peels.